Is the aluminum alloy wheel really good-looking? We will not be unfamiliar to aluminum alloy wheels, and it will be used as a more important indicator of appearance and configuration when consumers are weighed and compared to consumers. In fact, this practice I absolutely agree, because Aluminum Alloy hub has a steel wheel incomparable advantage, and has a greater impact on the day after operation. The heat transfer coefficient of aluminum alloy is three times higher than that of steel. Compared with steel wheels, aluminum alloy wheels can transfer the heat to the air more quickly, increasing the safety factor. The proportion of aluminum alloy wheel hub is smaller than that of the steel wheel, the average is only about two kg lighter than that of the same size steel wheel, and the lighter hub can also reduce the resistance of starting and acceleration. The precision of casting aluminum alloy wheel hub is much higher than that of the steel wheel, the roundness and the unbalanced weight are smaller, and the elastic modulus of the aluminum alloy is small, and the vibration resistance is better than that of the steel wheel hub. These two can effectively reduce the vibration of the vehicle, driving more comfortable. 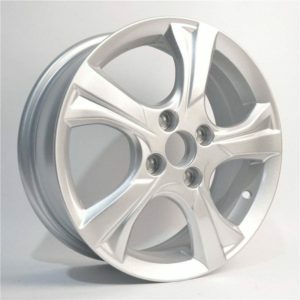 In high temperature liquid state, the fluidity and tension of aluminum alloy is better than steel wheels. The post polishing and electroplating process can create more beautiful and changeable appearance. The surface corrosion treatment and electrostatic powder coating also let its lasting.